Bug 315298: Fix crash when clicking an action in the context menu for a removed device in the Places Panel. See git commit 547d10aa, review request 108989. Bug 299371: Fix blinking when moving the mouse over an hidden item. See git commit 12d41a88, review request 108858. Bug 313342: When changing the “Single click/Double click” setting, apply these changes immediately. See git commit 17eeee6b. Bug 315315: Prevent expensive re-layoutings when opening folders with many items. See git commit daf12b8e, review request 108984. Bug 315210: When deleting an expanded folder which contains filtered files, make sure that those files do not reappear after clearing the filter. See git commit e053ecdc, review request 108976. At least the first part of Bug 252483: update the “Trash” icon in the Places Panel after restoring files. See git commit bf7cdfca. Patches were provided by A. Janardhan Reddy, Aniket Anvit, Aurélien Gâteau, and David Faure – thanks! If you use the “Show in Groups” feature and you have some files with non-ASCII names, you might be able to help us with a fix for next month’s bug fix release. Currently, some things do not quite work right, see the left side of the screenshot below. 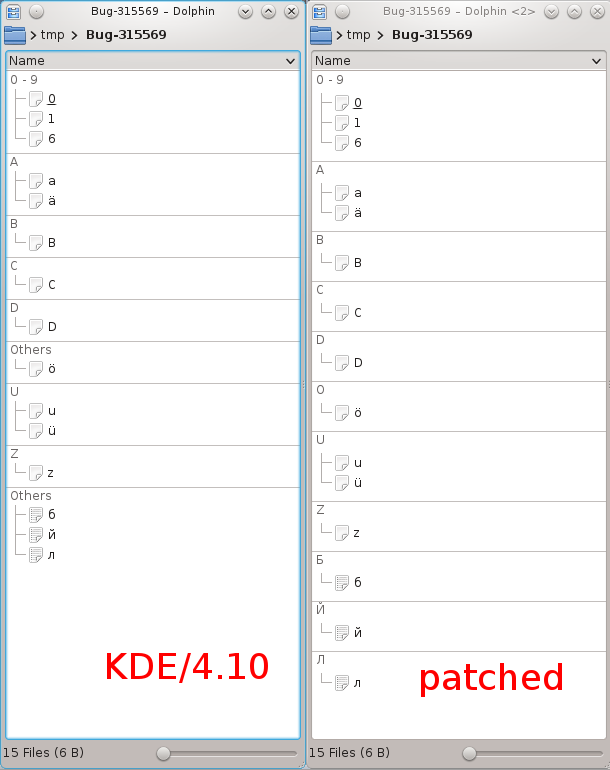 We have a patch that makes it look like the right side, but I would like to make sure that we don’t break anything in the 4.10 branch. Feel free to download the patch from the review request, and report any regressions there or in the bug report. Thanks. This entry was posted in KDE on March 15, 2013 by freininghaus. I love your focus on bug fixing. Thank you for making one of the core apps so extremely rock-solid, it is very much appreciated. I’m curious about the last screenshot – why are ä and ö shown under a and o, respectively? Those are very different letters (at least for Swedish people). I guess the same applies for u and ü. First of all, I haven’t written the original grouping code myself. What I’m trying to do at the moment is find a simple way to fix some inconsistencies which result in a rather broken grouping (see left half of the screenshot). It seems that in some languages/locales, a, o, u and their respective umlaut are mostly considered “the same kind of letter”. The current code tries to group them together if and only if the locale-aware sorting puts the umlaut, e.g., ä, in between a and b. This might still result in unexpected results in some locales, but I think that it will not be worse after the patch than before. Further improvements definitely make sense, but considering how many open bugs we have, how few bug reports we got for incorrect grouping (exactly one AFAIK, the one I’m trying to address here), and how much time our volunteer team of developers can spend on Dolphin, this will probably not happen in the near future. I see, thanks for the answer. I don’t use those special characters in filenames, so it has never bothered me. Thank you and all other Dolphin contributors for your hard work!